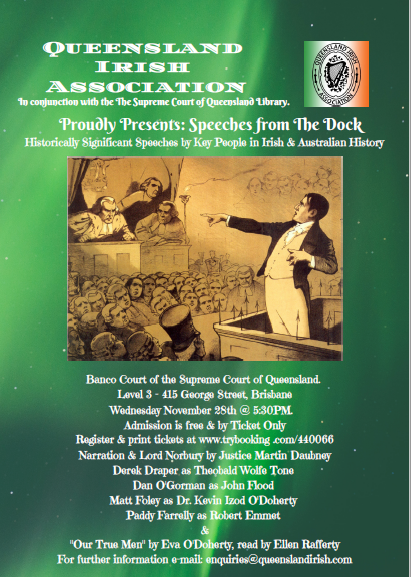 The Literature & History Sub-Committee have organised an event featuring speeches made by significant people in Irish history from the dock as they faced charges in court. Two of these people have a Queensland connection. It will be held in the Banco Court of the Supreme Court of Queensland – Level 3 425 George St. Brisbane commencing at 5:30pm on Wednesday 28 November 2018. Admission is Free and is by Ticket Only for security reasons. Seating is limited so a maximum of 4 seats may be booked by any one person. If you book a ticket and are unable to attend, please log back in and use the Return Ticket Facility so someone else is able to use the ticket. To book, CLICK HERE!